My type "B" personality has always enjoyed the phrase, "Indeed the world is unfolding as it should" - The Desiderata. On holidays, for example, I like the slow pace of discovering little gems here and there, rather than making a list of all the "things" that must been seen or done and then heading out to do them!! Why not let them come to you, or why not just head out and see what happens!! Here is what happened to us! 1. 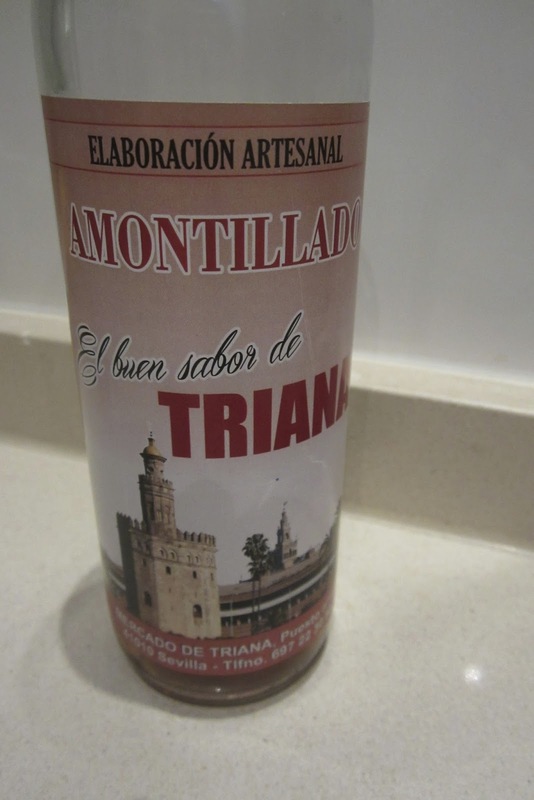 Since we went to the market every other day in Seville, we walked over the Guadalquivir river every other day. There was always activity on the river - impromptu kayak racing, sculling, big tour boats, smaller fishing boats - wonderful serendipitous finds!! 2. There were also the street entertainers. Although they were everywhere and never really seemed to change their music, or their activity, they could be "caught off guard" once in a while. 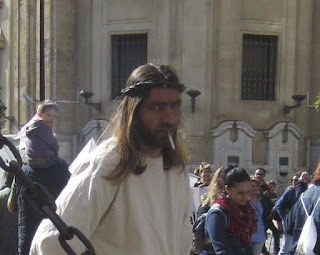 Somehow, I never imagined, "Jesus" taking a smoke break during his trials. 3. Beyond the flimsy flamenco dresses of the tourists shops, there were the couturiers. Shops here and there that offered the most amazing gowns with the traditional flourish of frills and flounces. If I were a foot taller, I would have bought one. 4. We also made several emergency runs to the two international book stores, we found in Seville. On the evenings we stayed in, we read. Yes, we did have a TV, but opening a book, looked a lot easier than trying to figure out the controls on the television, which offered mainly Spanish programs, anyway. Even, though I had brought three books with me, I ran out of reading material half way through the holiday. Somehow, I had never thought of reading "The Dubliners" in Spain. Then again I remembered reading "How Green Was My Valley" in Greece!! 5. Finally, there was The Cask of Amontillado. We went regularly to a stall in the market that had the most amazing olives, Spanish olives, of course, in so many different brines and marinades, with so many different combinations of artichokes, anchovies, tomatoes, pimentos etc., that I could have spent a whole day there, just deciding what to buy. In fact, I spent so much time looking down at the olive display, that I almost missed the casks of Sherry on the wall at the back of the stall. There had to have been seven or eight barrels, each with a different type of "Sherry from the wood." I decided to try an Amontillado, because one of my favourite short stories is "The Cask of Amontillado" by Edgar Allen Poe and we had made a point of going to Jerez, the sherry capital of the world, the week before - an amazing distillation of literature, locale and libation. I'll leave you to read the story!! Who put the "arch" in Architecture? Shrove Tuesday never looked so good! !